First, the Thumb Keyboard (BK01) is small in size, measuring 150mm x 90mm and weighs in at a light 96.6 grams (3.4 ounces). The keyboard boasts things like back-lit keys, a built in rear facing touchpad, a rechargeable battery, and even some keyboard kick stands for when you need to rest it on your desk or coffee table. 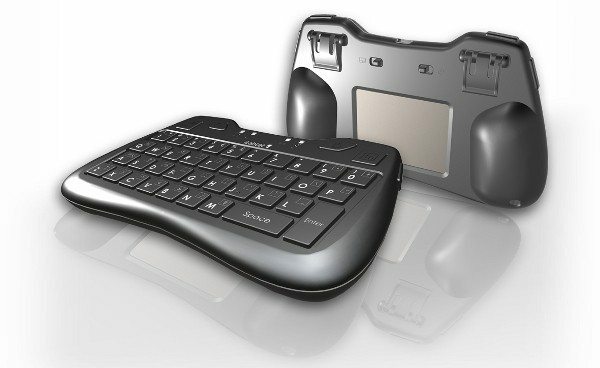 The ergonomic design makes it feel more like an XBOX 360 controller in your hands than a keyboard. The front of the Thumb keyboard features your backlit QWERTY keyboard, a CAPS lock / Windows Key button, an FN key, and four LEDs (FN, Power, Mouse, Bluetooth Pairing Mode). The right side sports the Bluetooth button (press and hold to place the keyboard in pairing mode) and the left side is fitted with the illumination button (when used in conjunction with FN) that doubles as the ALT key. The top is home to your USB for charging, Shift and CTRL keys. Around back is the rear facing touchpad, the power switch, and the touchpad power switch. The built in rear facing touchpad is designed to work from the keyboard position allowing you to maintain thumb access to all keys at all times. Mousing around on an iDevice or Android device will leaving you wanting as it just isn’t supported, but for HTPC’s, laptops, etc, the experience is awkward at first then somewhat gratifying. Having the right and left mouse buttons on the front of the keyboard means your thumbs will stay on the front of the keyboard (where they are meant to be) and you will likely be mousing around with your middle finger. The QWERTY keyboard feels sturdy and the keys are spaced far enough apart that you will not hit more than one accidentally while typing. However, the Space buton is awkwardly located on the lower right side of the keyboard making it difficult to get used to. If it were placed in the traditional bottom center you could reach it with either thumb. The largest issue with the keyboard on this device is the lack of dedicated backspace button. You are required to hit the FN key (upper right) and then the E key. This two step process for a simple backspace makes correcting mistakes difficult. The same goes for the arrow keys S (up), Z (left), X (down), C (right). 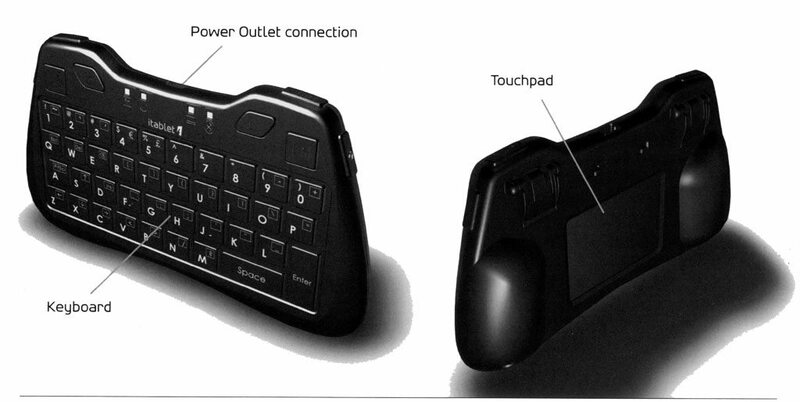 Perhaps the itablet Thumb Keyboard should been outfitted with a game controller style arrow system. Because the itablet Thumb Keyboard uses Bluetooth technology, Bluetooth 2.0 and Bluetooh HID 1.0, the connectivity options are nearly endless. You can literally connect it to almost anything: iPad, iPhone, PS3, Android Phones, PC’s, Laptops, etc.. If you have yet to pair a Bluetooth device, it is as easy as placing it in discovery mode, having your phone, tablet, pc, etc find discoverable devices, entering a series of nubers/letters on the keyboard and hitting enter. Finding the option to pair a device in Windows takes longer than the pairing process itself. The itablet Bluetooth Thumb Keyboard is meant for portability and it doesn’t fall sort of its intended purpose. The keyboard is small and useful. The backlit keys makes typing in the dark much easier and having Bluetooth connectivity means you can still use the keyboard without having to maintain line of site (VERY useful for HTPCs). The ability to recharge via USB is one of the best features and having gone for over a month now on a single charge is just outstanding. The rear facing touchpad is a HUGE bonus. The annoyance of having to use the Function key to backspace or arrow around is overshadowed by its $9.99 discounted cost at Microcenter! Bottom line… would I buy one? I did.